Bridge Global has been in the forefront to adopt Agile and has been able to couple this effectively in providing IT solutions to its client base. The company now has a good team of Scrum certified people and continue to add on more with each year. The quest to attain the perfect fluency in agile continues, with both internal and external team building experiences. The journey at Bridge has been an eventful one with important milestones that have carved the organization. One of the milestones that stand out, is in the year 2013, when we moved in to attain Scrum certifications. This diary will have multiple authors, keying in their real-life Agile practices and challenges, along with notes on how each challenge was overcome. The purpose in having a documented Scrum diary is to record agile events, questions, problems and blockers that a team faces on the go, while adopting an Agile methodology. A few frequently aired questions are below, and would hopefully be answered along the way! • How does a newbie product owner handle the pressure of being both responsible for the business value of his/ her product and also to make sure everything is in order for the team to actually start work? • How can an HR estimate a recruitment cycle? • What are the best qualities of a Scrum master? • Can a prospective client call, be an iterative sprint result? • What do you do when you realize that you have not yet carved out your product to the finish? • What happens when the team constantly goes off the MVP path? How do you reel them in? 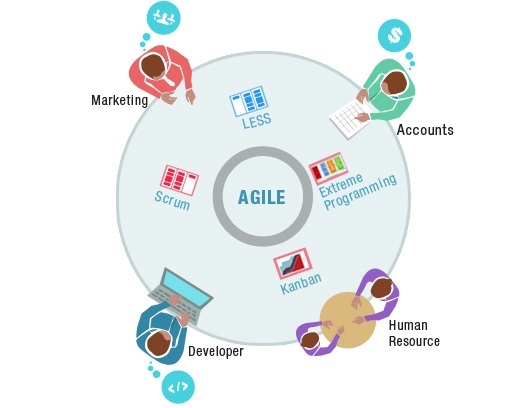 Stay tuned for the upcoming chapters that would include an MVP journey and HR journey into Agile!